In our earlier article we concluded that unless your cat is dirty, there is no absolute need to bathe him, though there are several benefits. But does the idea of bathing your cat drive you insane? In this article you are going to learn how to bathe your cat. Starting from where to do it, how to hold your cat and how to make bathing less traumatizing for both of you. Where to bathe your cat? There are several ways to bathe (or shower) a cat. Remember, bathing your cat should never involve actually submersing your cat in the water. 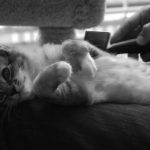 Several sources suggest to do just that (even, in fact, giving your cat a bath), but advice from a cat behaviorist and a professional pet groomer says – don’t do it. Submersing a cat is dumb, suicidal and unnecessary. Hissing shower head is likely scare your cat. Instead, cats are “bathed” under running water. In our experience, it’s best done in a bathtub or a sink under the faucet. Alternatively, you can do it in a shower though it is helpful to remove the hissing shower head, as its sound is likely to drive your cat crazy. The third plausible option is to place your cat inside a bowl, bathtub, or sink, and pour water from a cup on him. This is a good option if you don’t have a bathtub, if the faucet is too close to the wall, if your shower is narrow and uncomfortable, or if your cat is too afraid of the faucet. Whichever you choose, make sure you have enough space to hold and manipulate your cat, as well as to keep the things you will need nearby. Trim your cat’s claws to keep your own skin healthy. If your cat does not take claw trimming well, do this step on the previous day. Learn how to trim your cat’s claws here. 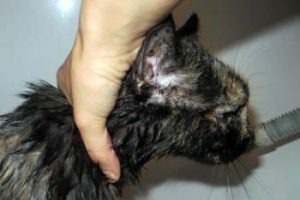 Learn to handle your cat before you try to give him or her a bath. Learn how to hold your cat below, and try it in advance without placing your cat near the bath. Place a rubber mat or a blanket inside the tub so your cat won’t slip. It’ll be easier for you to control him or her this way too. Adjust the water temperature in advance, or even open the faucet before the cat enters the bathroom. You won’t have much time to fiddle with it later. Do not open the faucet fully, because a strong water stream is likely to startle your cat. The temperature must be similar to the temperature you use to wash your own hair. 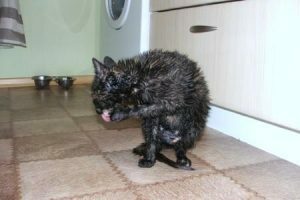 Don’t give a contrast shower (alternating hot and cold) to your cat, even if you like it yourself. Place everything nearby so you don’t have to search for shampoo while holding a cat. If you wash your cat alone, you will have only one free hand. Remove shampoo and conditioner caps and place towels within arm’s reach. Calm yourself down as your stress is definitely going to translate to your cat. Remember, it’s no big deal, you are just washing your cat. Play with your cat or pet him before washing. This will help to focus your cat’s attention and to provide something positive, which is proven to ease subsequent unpleasant events. Bring your cat inside the bathroom… and close the door. 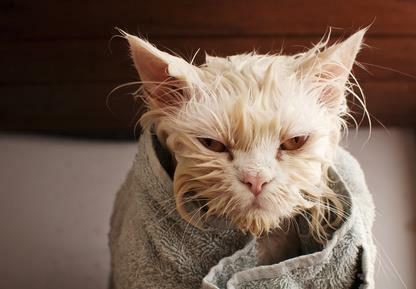 You don’t want to run through your house after a shampooed cat. Pick up your cat and place him inside the bathtub. Start by holding his hind paws in one hand, and place the palm of the other hand under his chest. Unless your cat scratches and bites you (in which case you should reconsider whether he really, really needs to be washed) you will be able to hold your cat with one hand and do the washing with the other. By his scruff, though make sure your grasp is not causing pain. Cats have a reflex to “freeze” when held by the scruff. It must, however, be done properly, and adult cats should never be carried by the scruff. With your index finger and thumb around your cat’s neck from behind. Try as seen in the photo on the left, you will notice how your fingers find a perfect spot to rest between your cat’s shoulders and head to prevent him from running forward or backward. Place a palm in front of his chest. This grip is easier to maintain, allowing you to focus more on the task. On the other hand, it also gives more freedom to your cat, and should be used only when a cat becomes more or less static. Most likely you will need to alternate between each of the three grips mentioned above, depending on which body part you are washing. Note that, even if you feel that your cat is standing still, do not release your hand for even a fraction of a second. Your cat may be still because of stress and sense of helplessness, but once the escape path becomes available, he will use it. And, a cat who has learned to escape from bathing is likely to try it again. If there is enough space, someone can help hold your cat. Four hands are much better than two. The other person can hold the cat in one of the ways mentioned above, while using the other hand to hold other body parts, too. When your cat is in the bath or bucket, you can open the faucet (if it isn’t already) or use the cup in your free hand. As you put your cat under the running stream, or pour water on him, you need to tousle your cat’s fur a bit so the water gets through to the skin. Unless your cat is dirty, it is a good precaution not to wash his or her head, at least until your cat gets used to bathing in general. Most cats, even if they accept being wet, become crazy when their head goes under the water. Use a pet shampoo. Cats (and dogs for that matter) have more sensitive skin than humans. The hair of cats is oilier than human hair, and the structure of the coat is also different than the human scalp. Is human shampoo toxic to cats? Not in general. Both human and pet shampoos come in many varieties, from paraben-stuffed shampoos to 99.9% organic shampoos. Washing a cat should be no different than washing your own hair. You rub the pet shampoo into your cat’s fur and rinse it out. Do it carefully, as any leftover can cause irritation and allergic response. Make sure to wash “problematic areas” such as armpits, chest, abdomen, and thighs. Prevent shampoo from getting into your cat’s eyes, ears, or mouth. Depending on your cat’s stress tolerance, aggression, and anxiety, you must find the best compromise between washing every inch of your cat’s body and keeping him sane. Causing less stress is more beneficial than washing your cat perfectly. If you wish, you can apply fur conditioner to your cat’s coat. While optional, conditioner makes your cat’s coat shinier, thicker, easier to brush, and less likely to mat. Basically, it works the same as human hair conditioner. You apply it to your cat’s fur, let it sit for a while and then rinse it out. However, the “let it sit for a while” carries several meanings, depending on your cat’s attitude towards the bathing. After rinsing your cat’s coat, you can squeeze the water out by gently pressing on his legs, paws, tail, and body with downward pushes. 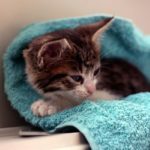 Wrap your cat in a dry towel and sweep his fur with gently, rubbing motions. If your cat does not insist on leaving, you can keep him inside the towel for a while to let it soak up more moisture. Most likely you will need more than one towel, because there will be a lot of water coming out of your cat’s fur. You can consider brushing your cat now, while his fur is still wet and slick, as it will untangle easier. 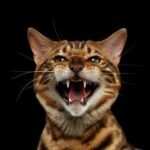 If you brush your cat on a regular basis, or you believe your cat has already been in too much misery, skip this step for today. Many, many cats are afraid of hair dryers because of the sound they make. Therefore, blow-drying is something that only a few cats will allow. Use a “regular” hair dryer. Turn it on at a safe distance from the cat (preferably on the lowest speed and medium air temperature) and slowly bring it closer to your cat. Start by drying body parts that are further away from your cat’s head, such as the back or hindquarters, and gradually build your way up. Remember not to hold the air stream on one body part for long, because it hurts. Dry your cat’s coat as you would dry your own hair, move the air stream from spot to spot and smoothly wave the hair dryer from side to side. Closely watch for signs of fear and aggression during the process. If your cat shows too much stress, consider skipping this process. It is possible to train a cat not to be afraid of a hair dryer. This is done by first turning on the hair dryer far from your cat for a very short amount of time, no longer than few seconds, and coupling it with something positive, such as treats. Gradually you can move the dryer closer and leave it on for longer, eventually getting your cat used to it. But do you really need it? After you are done, check what is that your cat wants. Giving treats and petting is helpful to reduce the stress. Playing is also beneficial, as it entertains the cat and allows him dry faster. However, if your cat does not respond, your best option is to leave him alone. Let him climb onto a cat tree, curl up inside a box or favorite napping spot, and interact with your cat only when he asks for it. Keep your cat indoors for at least a few hours, or for at least 12 hours if you did not use a hair dryer, longer if it’s really cold outside. Check if your cat is dried through to the skin before letting him outdoors. Don’t worry if your cat appears to groom himself a lot, it’s a normal response to stress and hair wetting. Also, they can shed excessively during the first day after the bathing. Your cat is likely to display other signs of stress, too, but they should be gone within a day or two.